The social hub of the home, the kitchen is no longer just a place to prepare food, but a multifunctional space in which to congregate, eat and entertain. To this end, choosing a new kitchen that works in harmony with family life as well as your home’s unique features has never been more important. Investing in a bespoke design, handmade to order, will make the most of the space, enhance its functionality and add value to your home. ‘The benefits of a handmade kitchen are not only in the wow factor and individuality, but also in the lifespan, as they can last for decades,’ says Papilio managing director, Matt Prall. A bespoke in-frame kitchen will have solid wood carcasses and doors, with traditional shelf lippings and dovetailed drawers – quality that should ensure it is far more durable than any off-the-shelf cabinetry. ‘In not being restricted by standard sizes, you can specify the exact dimensions required and build around odd features, such as awkward pillars or low ceilings,’ says Richard Moore, design director at Martin Moore. This beautiful kitchen design, handpainted in a serene shade of Willow, features natural oak veneer cabinets and Yukon Silestone worktops, complemented by white walls and marble flooring. Zimbabwe Black granite worktops and black cabinet handles offset this bespoke kitchen handpainted in Farrow & Ball’s Lime White. Featuring a classic pattern door, turned end columns, two-tier plate rack and chimney surround, the design is completed with a mosaic splashback. Farrow & Ball’s Off Black has been used here on this Shaker-style kitchen for dramatic impact, accented with brushed copper fixtures and complemented by a dark range cooker and checkerboard terracotta tiling. This Bovingdon kitchen made from solid oak, oak veneer and tulipwood, has been handpainted in Dark Lead by Little Greene. Polished concrete worktops and a Venetian plaster splashback complete the look. Made from pine and tulipwood, this classic Victorian kitchen has been handpainted in Merriott, with timber worktops, brushed steel fixtures and on-trend grey walls providing a contemporary touch. With hardwood frames and European oak drawers, this Artisan in-frame kitchen has been handpainted in Old Bell House, with the island in Pantry White. Terra Bianca natural granite worktops and splashback add additional wow factor. 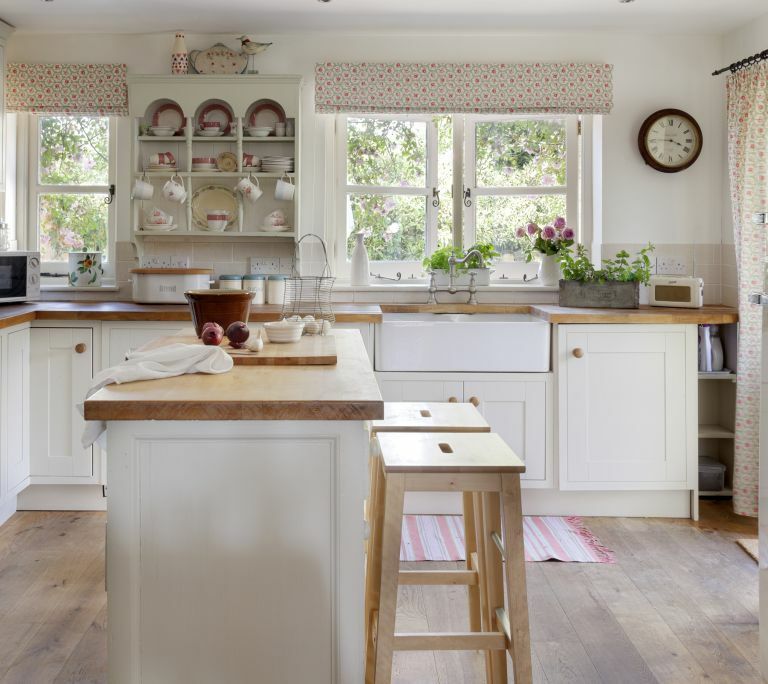 Created from natural pippy oak, with its close burr cluster patterns, this in-frame design perfectly complements this country kitchen, complete with cream Aga and dark grey granite worktops. In keeping with the high timber beams, the Classic English design in this converted dairy is made from tulipwood and maple with solid oak drawers. Handpainted in Flint and a custom-mixed shade, it’s finished with honed black granite worktops and Bella brass door furniture. A solid bronze carcass base island with handleless drawers and Patagonia marble worksurface give this bespoke Brasserie kitchen, handpainted in RAL colour 0102025, a truly contemporary feel. Wardrobe cupboards make the most of the high ceilings and windows in this kitchen. The bespoke design is handpainted in Fired Earth‘s Bone White and Apres Ski inside the cabinetry, completed with Moon White granite worktops in a leathered finish. This bespoke maple kitchen, handpainted in Farrow & Ball’s Hardwick White, features large dovetailed oak drawers on fully extending soft-close runners. An island painted in Hague Blue, topped with French oak, provides a pop of colour, with copper pendant lights and large tumble-edged limestone flags providing complementary accents.